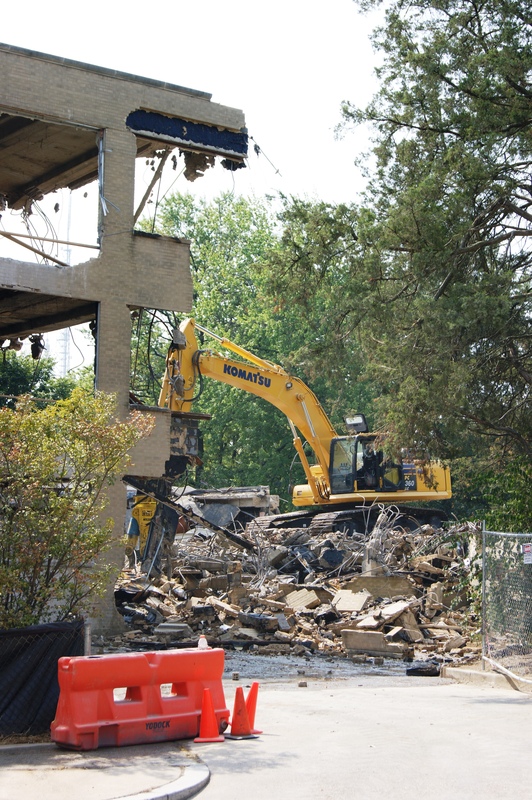 Demolition in Full Swing at AU Tenley Campus | Tenleytown, D.C.
Posted on September 10, 2013 by Tenleytown, D.C. Structural demolition at the American University Tenley Campus began this week as construction of the new Washington College of Law moved into the next phase. According to the university, Congressional Hall, Federal Hall and Constitution Building will be torn down, while the historic Dunblane House and Capital Hall will be preserved and integrated into the new law school campus. Dunblane, built as a private estate in the first half of the 19th century, was home to a hunt club in the late 1880s and later an elementary school in the 20th century. Capital Hall was the former site of the Immaculata Seminary, established in 1905 by the Sisters of Providence. It subsequently became Immaculata Preparatory School and then Immaculata High School, which closed in 1986. Once complete in the fall of 2015, the Washington College of Law will host 2,500 faculty, staff and students. Regular updates on the construction, as well as information on and visual renderings of the new law school can be found on the American University website. And for those who need a daily fix of construction updates, American University is hosting a live webcam feed of the site. The webcam is not very close to the current action, but demolition can be seen at the left and right edges of the screen.